This high performing ventilator is the ideal choice for any critical care department that needs to transport ventilated patients to the MRI department. Ventilation care is continuous from the ICU department to the MRI scanner and back. 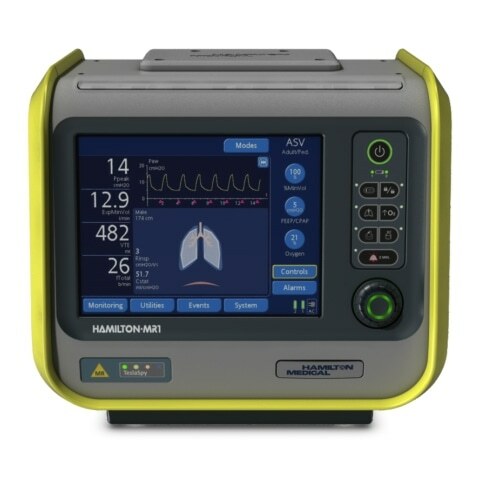 The Hamilton MR1 comes with the standardized Ventilation Cockpit from Hamilton Medical and the unique intelligent ventilation mode, Adaptive Support Ventilation (ASV®). With the Intelligent Ventilation mode built in there is improved patient safety and comfort, increased ease of use and increased efficiency. The MR1 also contains more than nine hours of battery operating time and independent air supply. The Hamilton MR1 can be used for adult, pediatric and neonatal ventilation.